Announcement Welcome to my Etsy shop & thank you for stopping by! 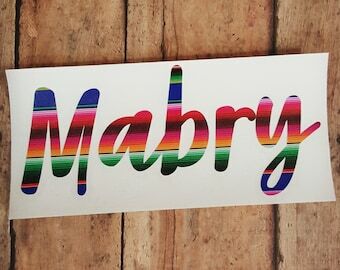 Everything in my shop is done with custom cut vinyl decals that are all made by me on a professional cutter with high quality vinyl. I do not use craft grade vinyl or a craft cutter. Everything is created in my studio and takes time to complete, because all orders are custom created at the time the order is placed, I do not have anything 'ready to ship'. Orders are worked on in the order that they come in to me and sent out as soon as possible. Please contact me BEFORE placing an order that is needed by a certain date. Do not leave the date you need the order by in the notes without contacting me first. I will not see your note until I get to your order. Any questions about care for items, polices & current turn around time can be seen in the policy section. If you have any questions, please don't hesitate to convo me and I will get back to you as soon as possible. BrandywindHD is CLOSED on Saturday and Sunday to spend time with family. Any messages received over the weekend are answered the following week. Welcome to my Etsy shop & thank you for stopping by! Looks great, and I added it to my own wine tumbler that I had at home! 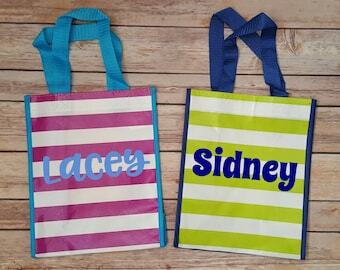 I love these bags and am ordering a few more soon. Perfect size and sturdy too. 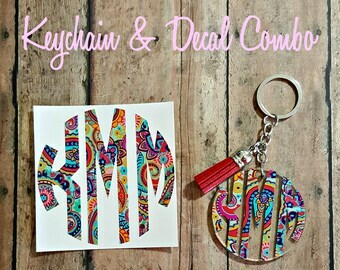 Paisley prints make cute monogram keychains. 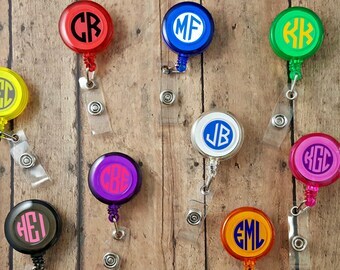 These are 2.5" round acrylic keychains with many personalization options. Get yours today, they sell out fast! I can help you meet your personalization needs. What are you looking for? 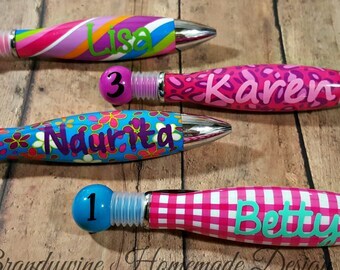 Super cute personalized pens are great gifts or for back to school. I have several listings with bubble pens in different designs and colors. What's up with the FREE Standard Shipping for Decals? 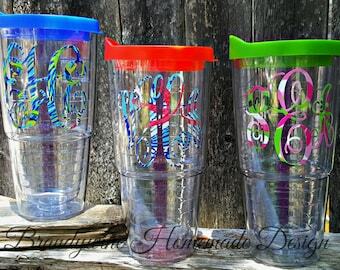 Free shipping for monograms and decals does NOT include tracking. This will be a standard stamped envelope. You are always welcome to upgrade to tracked shipping at checkout. Please make sure your address is accurate and in the correct format. This will be a stamped addressed envelope. 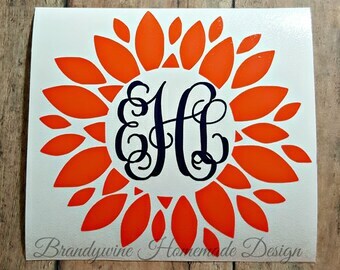 Monogram/ decal orders that total $20 or more will be shipped USPS first class with tracking. If you did not purchase shipping with tracking and claim you have not received your item, I will not resend it until at least 30 days after the initial ship date. Custom orders are handled by a case by case basis. Depending on the current work load I will take on custom orders. If you have something in mind just send me a message so we can chat. 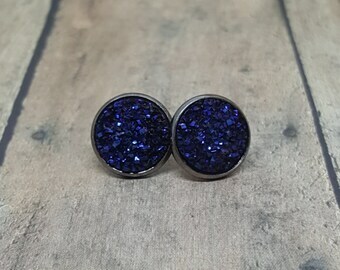 Do you accept return/ refunds on custom orders? 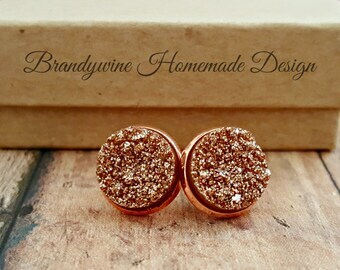 All items in this shop are custom and made to order. Due to the nature of the items sold, ALL SALES ARE FINAL. Refunds will only be given if an item is defective or incorrect and are handled on a case by case basis. The initials on my order are incorrect. Will you remake my items(s)? as possible. For EVERY listing in the shop, the instructions are listed to provide initials in first last middle order. They are copied and pasted from your order for accuracy. The shop will not redo/remake/refund due to a buyer error. It is the responsibility of the buyer to provide the initials in the correct format. Do you offer a badge reel warranty? The badge reels are made to last. In the event that your badge reel breaks within the first 30 days of normal use, please contact me along with a picture of what is wrong with it. (broken clip/retractable reel broken, etc) I am more than happy to replace your badge reel if you pay for the cost of shipping for your new reel. Our Tumblers, Mugs & Wine Glasses are NOT Dishwasher or Microwave safe. Please hand wash these to maintain the integrity of the product. Our patterned vinyl is printed with a special printer and eco solvent inks to ensure that it is of the best quality. The ink has a 3 year UV resistant warranty, meaning it will not fade for 3 years in sunlight. However, there is no warranty against scratches and fading from being handled. Our hands have oils in them, and these oils can be destructive to printed vinyl - unfortunately! Please take this into consideration if you plan to place this vinyl in areas that will constantly be touched. How long do orders take before shipping? Most orders take between 2-3 business days. Please contact me directly if you need a rush order. I do not see the notes on the order until processing. Can I use the printed vinyl decals on my phone or phone case? Yes, however if applying this to your phone or phone case, the oils from your hands will fade the pattern away pretty quickly. I recommend a solid, glitter or holographic vinyl for this, you can browse my other listings for these options.